With the death at the age of 89 of Michele Ferrero – the second generation of the family confectionery business that produces Nutella and Kinder eggs – attention has turned to the future of the company. The current CEO, Michele’s second son Giovanni, appears not to have been the chosen successor and took over when his brother Pietro died at the age of 47. So what will happen to the business? Its competitors will surely be taking a look. Change could be on the cards. But despite all the speculation, it is possible that things will remain the same, and that Giovanni will continue to control the business much as his father did. And why not? Primogeniture is often denigrated, but it is a very successful system that has sustained many family enterprises, including landed estates and the aristocracy, for a very long time. You can argue about its attractiveness and say that it is neither fair nor democratic – but in terms of sustainability, the system has a long pedigree. Of course, there are pressures that make it challenging. Primogeniture works best when a business stays as it was before because the family members have grown up in it, they learn about it and understand it and maybe they have sufficient skills to keep it going. The business Giovanni has inherited is vastly different to the one his father inherited, and the one he grew up in. Obviously there is a loyal team in the background who are motivated enough to help the CEO continue the business, and also a wider family who we presume want to keep it going. But it will be interesting to see if this model can be made to work. When discussing Ferrero it is desirable to avoid the tired cliches about “shirtsleeves to shirtsleeves in three generations”. There is nothing special about a third generation that makes it more likely that a business will fail while it is in charge. The real issue is complexity. As you go down the generations three things happen to make a family business more complex. Firstly, in most cases your family will grow, and we are not just talking about the traditional idea of the extended family. There are blended families, and different sorts of relationships, and in some places family includes non-bloodline kinship groups. 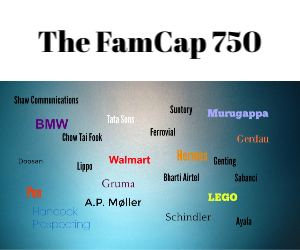 So in most family enterprises over three generations the family gets more complex. Second, ownership also becomes more complex. Either it will fragment or it will be consolidated, and each brings a degree of complexity – either you are going to end up with a lot of shareholders with minority stakes, or you end up with big chunky stakes that are often held in trusts, and trusts are not living, breathing family shareholders but entities with different responsibilities and characteristics. Third, the business will either have diversified through acquisition, investment or entrepreneurial activity, or become dominant in one sector, like Ferrero. The question is, how do families cope with all this change? Families are naturally resistant to change and try to move forwards by replicating the past, sticking with a form of governance they are familiar with and which is justified by saying things like “it has worked in the past’’. But governance structures can easily get out of synch with the needs of the growing and more complex family, business and ownership group. Often what you see in the third generation is the family facing up to the challenge of changing their governance to deal with this complexity. Some do this by keeping things tight and deciding not to grow the business or reducing the number of family shareholders. This approach can work, but if a family delays addressing the problem for too long the complexity can become overwhelming: there are too many shareholders, the trustees don’t play ball, and the family often become distant from each other. If they want to deal with complexity, families have to bring governance of the family and owners up to the same standard of professionalism as the business itself. Successful ones see the bear-trap in the road ahead, and deal with it sooner rather than later.